UP power on 629 in Fort Edward waiting to bring a loaded sludge train to Selkirk. 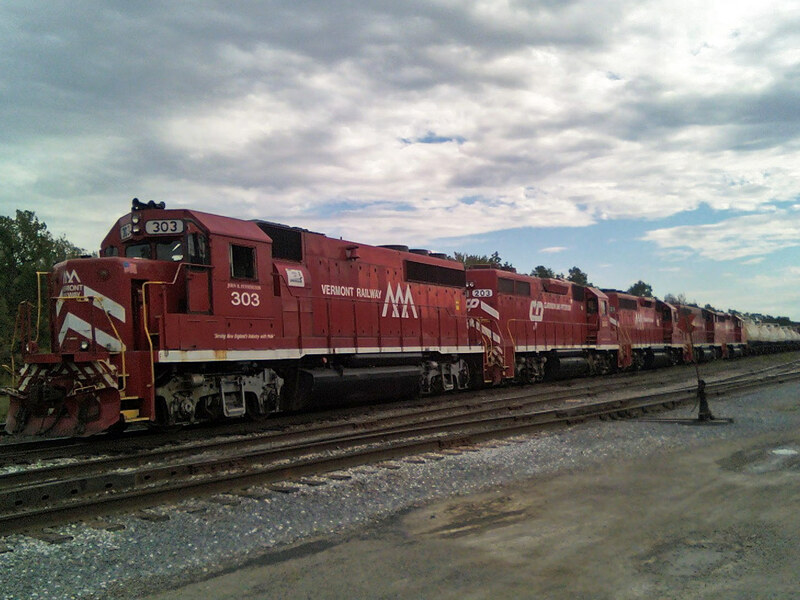 All Vermont Railway power on a detour train in Elnora. VTR detour in Whitehall waiting for a crew. We ran the trains as 690/691, Whitehall to Elnora and back and interchanged trains with Pan Am. 9/15/11. John Camerota caught Pan Am's MOED heading east across the Hudson River. Saratoga and North Creek "Hudson Express"
Two photos fresh from the camera taken less than eight hours ago at the time I wite this. I have to confess, I went out stalking last night. Stalking an E8! Ha,ha,ha! 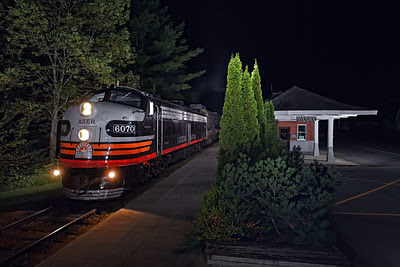 The AZER 6070 was working the Saratoga and North Creek "Hudson Express" which departs from Saratoga in darkness at 9:30 pm for North Creek. This is a friday only night run. I am grateful! My original location planned for tonight was the bridge at Hadley, NY and I arrived there with plenty of time to set up inspite of doing some wandering around town lost. I have to expect this when I arrive at a new location after dark. 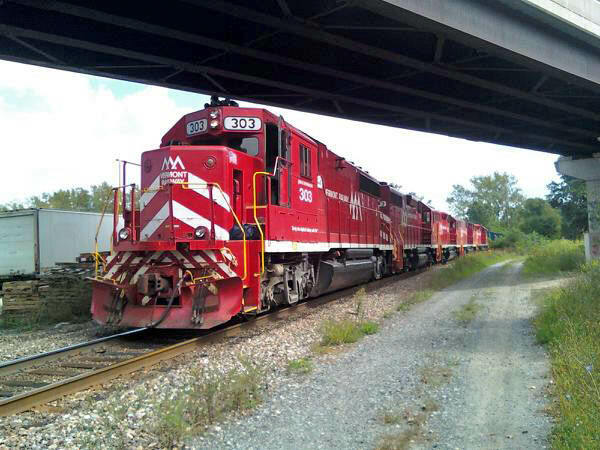 After driving around the bridge and then getting out and going for a walk across the one lane historic highway bridge alongside the railroad bridge, it became apparent to me............I was screwed! LOL! Almost getting run down on the narrow highway bridge had nothing to do with my conclusion. Sheesh! So I headed back north (after heading south to Cornish, NY by mistake) going out Rte. 9N to Lake George and up I87 to the Riparius exit. I found Lake George (around the I87 ramps) to be an embarrassing display of glitz. I ate my Veggie-Delite on the way in there at the busy intersection of Rte. 9L & 9N, with some kind of kids fun park lit up behind me, rv's going by disguised as full sized buses amid the heavy traffic and eating establishments trying to outdo each other in attracting your attention. Happily I avoided that area returning from Hadley by jumping on the interstate. 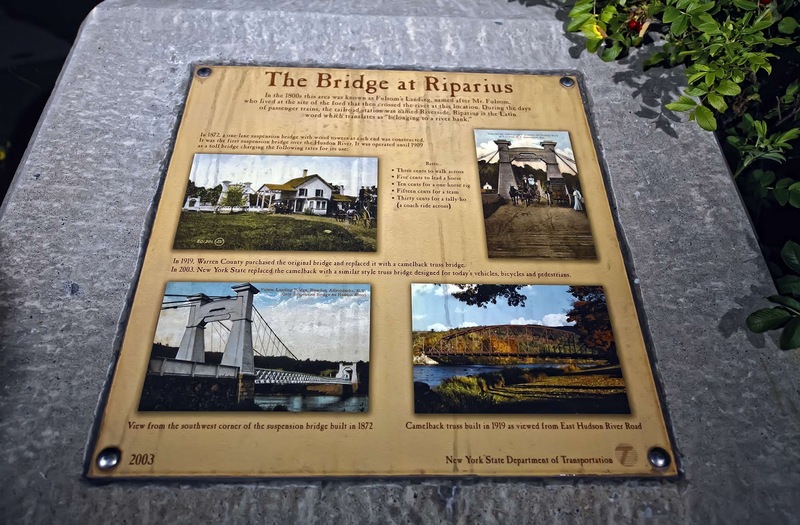 I remembered the Riparius exit and after stopping a couple times to check my Delorme Atlas I was crossing the large bridge over the Hudson and had arrived at the station. To be honest, I was thinking I would be hard pressed to find a different, better spot to shoot here after wandering around last friday night. 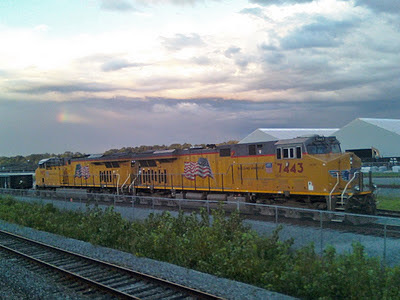 And I had prety much given up after driving down to eyeball the old freight shed, and was driving out to head for North Creek station when the caboose caught my eye as I drove past. At this point it's 10:30 pm, the train is due in an hour roughly and I pay attention to any indication there might be a photo here! Stopping, I back up the civic and step out to check out the caboose. The steps onto the rear platform have a chain across them attached to a ring by a latch, easily operable. No signs that say no trespassing, and the platform provides the always desirable elevation..............I undo the latch and go up the steps! I take a look........Oh My Gawd! Oh My Gawd! I turned and stepped down onto the ground, turned off the car and started setting up the lights! All set up forty five minutes later, it was tea time at Riparius, as there was no sign of the Hudson Express. That was fine with me, as I was sure they had not gotten by me. Up in the woods across the street to the right of the scene a deer was snorting at me, impatiently waiting for me to leave so it could come down to the river for a drink. You see, deer are wary and shy for a good reason, moose on the other hand, are not! A moose would just barge straight through enroute to the river no problem. Just before midnight the familiar sound of non-turbocharged 567s accompanied by the sight of the rotating roof top beacon reached me, and shortly afterwards the "Hudson Explorer" pulled in to a stop. The AZER 6070 stopped maybe twenty feet short of my mark, what a sight this engine presents at night! I waited for engineer Tom Carver to issue two short whistle blasts before he started moving towards me, eventually rolling into position as I crouched behind the camera. The flash lighting captures the moment as Tom passes by in the cab of 6070! The image on the lcd monitor presents evidence of another successful friday night on the Saratoga and North Creek! Never in my wildest dreams did I imagine myself doing night photos of an ex-Chicago & North Western E8 wearing the Southern Pacific "Black Widow" paint scheme! Bring on the PA's! Ha,ha,ha! Afterwards I wandered around the manicured grounds along the nearby Hudson, not wanting to give up my seat on "cloud nine" don't you know! And I found an excuse to stay on board by shooting the second attached photo of a historical plaque commemorating the history of the location the current bridge occupies. It may be of interest to you. Shot in Riparius/Riverside, NY on September 3, 2011 at 00:07 with the 5D and Nikkor 14-24/2.8 lens set at 24mm and f2.8. Please enjoy! Comments are welcomed.